For other uses, see Peridot (disambiguation). Peridot (/ˈpɛrɪdɒt/ or /ˈpɛrɪdoʊ/) (sometimes called chrysolite) is gem-quality olivine and a silicate mineral with the formula of (Mg, Fe)2SiO4. As peridot is a magnesium-rich variety of olivine (forsterite), the formula approaches Mg2SiO4. The origin of the name peridot is uncertain. The Oxford English Dictionary suggests an alteration of Anglo–Norman pedoretés (classical Latin pæderot-), a kind of opal, rather than the Arabic word faridat, meaning "gem". The Middle English Dictionary's entry on peridot includes several variations : peridod, peritot, pelidod and pilidod – other variants substitute y for the is seen here. The earliest use in England is in the register of the St Albans Abbey, in Latin, and its translation in 1705 is possibly the first use of "peridot" in English. It records that on his death in 1245, Bishop John bequeathed various items, including peridot, to the Abbey. Peridot is one of the few gemstones that occur in only one color: an olive-green. The intensity and tint of the green, however, depends on the percentage of iron in the crystal structure, so the color of individual peridot gems can vary from yellow, to olive, to brownish-green. In rare cases, peridot may have a medium-dark toned, pure green with no secondary yellow hue or brown mask. Olivine, of which peridot is a type, is a common mineral in mafic and ultramafic rocks, often found in lava and in peridotite xenoliths of the mantle, which lava carries to the surface; however, gem-quality peridot occurs in only a fraction of these settings. Peridots can also be found in meteorites. Peridots can be differentiated by size and composition. A peridot formed as a result of volcanic activity tends to contain higher concentrations of lithium, nickel and zinc than those found in meteorites. Olivine is an abundant mineral, but gem-quality peridot is rather rare due to its chemical instability on Earth's surface. Olivine is usually found as small grains and tends to exist in a heavily weathered state, unsuitable for decorative use. Large crystals of forsterite, the variety most often used to cut peridot gems, are rare; as a result olivine is considered to be precious. In the ancient world, mining of peridot, called topazios then, on St. John's Island in the Red Sea began about 300 B.C. The principal source of peridot olivine today is the San Carlos Apache Indian Reservation in Arizona. It is also mined at another location in Arizona, and in Arkansas, Hawaii, Nevada, and New Mexico at Kilbourne Hole, in the US; and in Australia, Brazil, China, Egypt, Kenya, Mexico, Myanmar (Burma), Norway, Pakistan, Saudi Arabia, South Africa, Sri Lanka, and Tanzania. 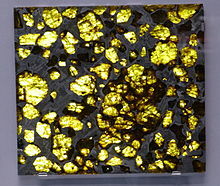 Pallasite meteorite with olive-green peridot crystals, found in Fukang, China. Peridot is sometimes mistaken for emeralds and other green gems. Notable gemologist George Frederick Kunz discussed the confusion between emeralds and peridots in many church treasures, notably the "Three Magi" treasure in the Dom of Cologne, Germany. The largest cut peridot olivine is a 310 carat (62 g) specimen in the Smithsonian Museum in Washington, D.C.
Peridot olivine is the birthstone for the month of August. Peridot (voiced by Shelby Rabara) is a major character on the Cartoon Network show Steven Universe. Peridot (voiced by Yuki Kaida) is a character on the Japanese anime show Jewelpet. She is depicted as a papillon dog. ^ Sherman M Kuhn (1982). Middle English Dictionary. University of Michigan Press. pp. 818–. ISBN 0-472-01163-4. ^ Sir James Ware (1705). The Antiquities and History of Ireland. A. Crook. pp. 628–. ^ Wise, Richard W. (2016). Secrets Of The Gem Trade, The Connoisseur's Guide To Precious Gemstones (2nd ed.). Lenox, Massachusetts: Brunswick House Press. p. 220. ISBN 9780972822329. ^ "Although some good olive-colored crystals are found in a few other places, like Burma, China, Zambia, and Pakistan, ninety percent of all known peridots are found in just one place. It is a Native American reservation, and it is located in a little-visited corner of the United States. San Carlos" Finlay, Victoria. Jewels: A Secret History (Kindle Locations 2543-2546). Random House Publishing Group. Kindle Edition. ^ "August Birthstone". American Gem Society. Retrieved June 28, 2013. ^ Thurm, Eric (December 22, 2017). "Peridot wilts, then blossoms on two emotional Steven Universe episodes". AV Club. Onion, Inc. Retrieved 28 June 2018. ^ Borenstein, Jay (June 25, 2016). "20 Times Peridot From "Steven Universe" Was Our Favorite Gem". Buzzfeed. Retrieved 28 June 2018. 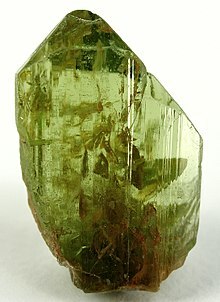 Wikimedia Commons has media related to Peridot.